Exmouth is a town on the tip of the North West Cape in Western Australia. Get ready for a full day of sightseeing on the 22nd (Sun): look for all kinds of wild species at Ningaloo Reef, stroll through Turquoise Bay, and then view the masterpieces at The Ningaloo Gallery. To find maps, photos, traveler tips, and more tourist information, refer to the Exmouth day trip tool . Rome, Italy to Exmouth is an approximately 26-hour flight. You can also do a combination of train and flight. The time zone difference moving from Central European Time (CET) to Australian Western Standard Time (AWST) is 7 hours. Traveling from Rome in December, things will get much warmer in Exmouth: highs are around 43°C and lows about 24°C. Cap off your sightseeing on the 23rd (Mon) early enough to travel to Denmark. Kick off your visit on the 24th (Tue): identify plant and animal life at Anvil Beach, explore the striking landscape at Elephant Rocks, then stroll through Greens Pool, and finally stop by The Denmark Heritage Cider Company. For maps, traveler tips, where to stay, and tourist information, go to the Denmark day trip planning app . You can fly from Exmouth to Denmark in 9.5 hours. Other options are to do a combination of car and flight; or drive. When traveling from Exmouth in December, plan for cooler days and slightly colder nights in Denmark: temperatures range from 26°C by day to 13°C at night. Finish your sightseeing early on the 24th (Tue) to allow enough time to travel to Perth. Satisfy your inner culture vulture at Fremantle Prison and Trowbridge Gallery. Relax by the water at Cottesloe Beach and Scarborough Beach. 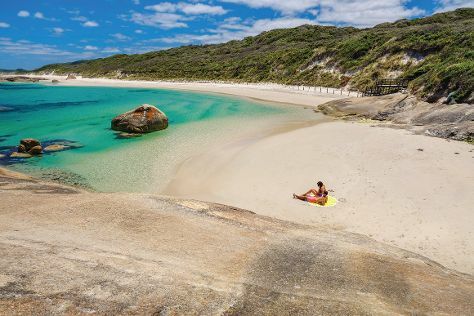 You'll find plenty of places to visit near Perth: Caversham Wildlife Park (in Whiteman), Warnbro Beach (in Warnbro) and Dolphin & Whale Watching (in Mandurah). The adventure continues: shop like a local with Fremantle Markets, stop by Nosh Gourmet Food & Gifts, steep yourself in history at The Bell Tower, and appreciate the history behind Kings Park War Memorial. To see ratings, maps, photos, and tourist information, use the Perth holiday tool . You can fly from Denmark to Perth in 5 hours. Other options are to drive; or take a bus. Expect somewhat warmer temperatures when traveling from Denmark in December; daily highs in Perth reach 35°C and lows reach 17°C. Finish your sightseeing early on the 28th (Sat) to allow enough time to travel back home.